Our latest exhibition is an account of Non-Conformity in South Gloucestershire – Protestant groups who declined to follow the rules and ceremonies of the established Church of England. Some of these groups were specifically identified in Charles II’s 1662 Act of Uniformity and suffered disadvantage and unequal treatment as a result, being barred from public office and from pursuing university degrees. Over time, more groups were identified as non-conformist. Their chapels can be seen throughout South Gloucestershire. Our exhibition covers a range of themes and also homes in on some specific details, such as the life and career of Handel Cossham, a prominent Non-Conformist lay preacher. Did you know that this coal-mining entrepreneur, the largest employer in the West of England, a public benefactor and builder of several schools, a man who was a JP, the MP for Bristol East, and twice Mayor of Bath – was born in the tiny, now rather dilapidated, cottage situated next to Age UK in Thornbury High Street? You may read the plaque on the house which says so. In fact, he was born in the same room as his great grandfather, grandfather and father had been born. When Handel died, 50,000 people lined streets in Bath and Bristol to watch his funeral procession. You can find out more about him in the exhibition, including how he came to be called Handel and how he made a successful career in the coal mining business. Pop in and discover for yourself something of the history of religious non-conformity in South Gloucestershire. Elements of this FREE exhibition have been created in collaboration with Frenchay Village Museum, Kingswood Museum and Yate Heritage Centre, working together as members of the South Gloucestershire Museums Group. Some visitors liken our museum to the Tardis – they’re amazed at how much is packed in. For the National Heritage Weekends in September, we’re giving you the chance to see what’s packed in behind the scenes too. Let our curatorial volunteers show you what happens when an item enters the museum – and its journey, until it either goes on exhibition or goes into storage for exhibition or research at a later date. In any given month, 50 or 60 volunteers work in the museum, drawn from the town of Thornbury and the surrounding villages. Come and say hello to some of them! The museum will be open so that you can drop in any time you like from 10am to 4pm on either Saturday 8th September or Saturday 15th September. It’s absolutely free. We look forward to welcoming you and showing you behind the scenes! What happened locally after the Great War ended in November 1918? How did Thornbury and the local villages welcome home in 1919 men who had been away for so long and seen so much? How did they commemorate those that didn’t come home? Come and see photos, objects and documents showing what happened in Thornbury, Charfield, Cromhall, Tytherington, Olveston, Littleton, Tockington, Alveston, Pilning and Redwick, and Oldbury on Severn. The Littleton vicar penned a special Welcome Home Song for the returning soldiers and sailors, and sang it to them, to the tune of Widdecombe Fair! In this centenary of men returning from the Great War (and many of course did not return), do come and discover some of the fascinating details of our own area one hundred years ago. Hurray! – the Severn Vale Art Trail is back – and we’re delighted to be hosting three artists and some of their fantastic work. Clare Stephens’ pottery is made and decorated using traditional ceramic techniques – and is both attractive and highly practical. Rosemary Millar’s gorgeous silver and gold jewellery incorporates semi-precious stones and pearls which Rosemary sources from all over the world – but the beautiful pendants, bracelets and earrings are created right here in Thornbury. It’s worth coming in just to see how beautifully her work is displayed! Lorraine Durant paints evocative pictures of mountains, coasts and local scenes. Come and see whether there’s anywhere you recognise. Whenever you come, there’ll always be at least one artist on hand for you to chat to as you look around. They love talking about what they do, so don’t be shy. Ask them how they go about their work, what materials they use – and what really inspires them. Maybe when you discover how they took their first steps in art, you’ll be inspired to try something new too! In this centenary anniversary year of the last year of fighting on the Western Front, come and discover some stories of local losses in 1918. Read about the backgrounds and the war experiences of some of the men remembered on Thornbury’s Parish War Memorial. This display is in our upstairs front room. Downstairs, we have a larger exhibition, telling the story of the Peace and the community coming together to commemorate local losses through war memorials – but also cruelly experiencing deaths among the local civilian population, as waves of the influenza pandemic struck Britain. You can find recipes from a local Thornbury baker (check out his recipe for Mysterious Pudding! ), accounts from a Thornbury shop, and a ledger from Thornbury Railway Station – from the time when trains actually ran to Thornbury! Lots of lovely things to explore and do and find out about! If you settle into our Children’s Corner, you can colour or draw or play word games. Do you like colouring pictures? See if you can find a lady in Tudor dress to colour in. Design your own coat of arms. You can even design your own Tudor floor tile. If you like puzzles, find the picture sheet of Crowns and use your detective skills to join the words and the pictures. 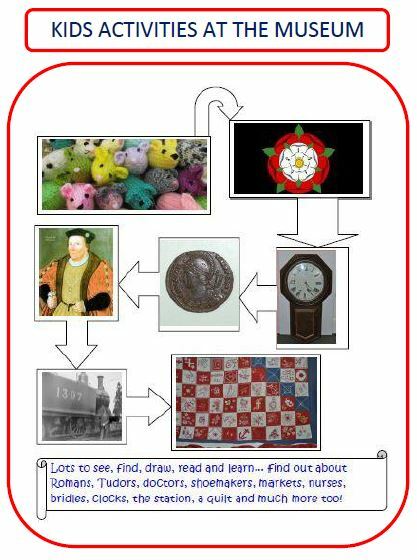 Or you can do a Word Search – lots of words about the Tudors and Henry VIII to find! Perhaps you’d like to explore the museum and see what unusual and interesting things you can find out about the place where you live and go shopping? Bet you can discover things your parents don’t know! …if you can find all the little knitted mice that are hiding around the museum, you can choose one of these to take home. Our volunteers have been delving into the Museum’s Store Room to produce a new exhibition. You’ll discover the contents of Thornbury midwife Nurse Cotton’s bag and see what Dr Reid of Olveston carried in his case. We have a selection of 19th and 20th century spectacles. See whether you think they’d suit you! You can also discover the medicinal properties of gunpowder, read about the wonderful Thornbury perfume, find out about local dentistry services and discover the stories of some notable local doctors from the town’s past. This is all in the upstairs exhibition room, while downstairs “Curious Works and Stately Lodgings: the Art of Thornbury Castle” continues. Come and have an explore – it’s all free.